See links at the bottom for other picture slideshows. 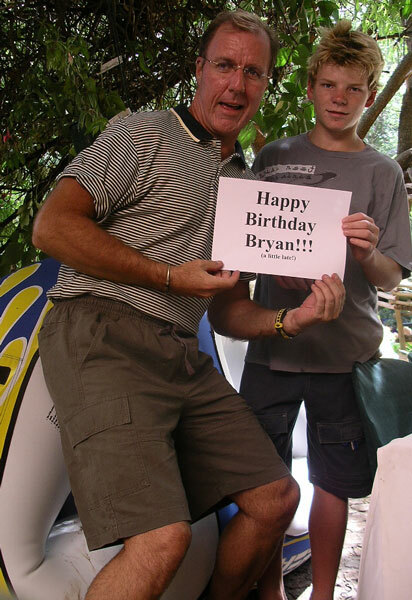 Wishing Bryan a happy 20th! Wishing Robbie a happy ??th! Kali makes a new friend. The stockings were hung by the chimney with care. Guinness attends a staff meeting with me. It was raining, he had nothing better to do. Rosemary decorating the tree. Meriam, Sisipho and Storm helped too. Sarah-Pat not too comfortable in her 3rd Birthday Party dress. Mom helping Sarah-Pat blow out the Barbie candles. Must be a Scottish piper at Saturday's wedding! Our boy was missing for 6 days but made it home safely! Our family Christmas card. The living Nativity scene at Carols by Candlelight. A view of Carols by Candlelight from my room. Sunset on the Vaal on the Summer Solstice. Christmas morning! Me, Sisipho and Sarah-Pat, Christmas morning. Ready to feed 500 people Christmas lunch. Me and my South African family, Christmas morning. Guess who got to play Santa and give out gifts. And I got a few gifts myself. Christmas Day lunch starts to fill up. Checking out the crowds at Christmas lunch. Guinness made himself at home with a table of customers. Rosemary had to help me a little with my Christmas cracker. It's harder than it looks! Our family Christmas dinner. Me and the Cloete siblings, Shirley, Peter and Rosemary. Click here to go back to my BLOG. Click here to go to November's pictures. Click here to go to October's pictures. Click here to go to July to September's pictures.